There’s a difference between a performance and an experience, between an impersonation and a recreation, and between a moment and a memory. Anyone that has seen Elvis in concert before will tell you it wasn’t a performance – it was an experience. They can tell you the difference between the two is in the details, and they can also tell you an Elvis experience is an electrifying one that you never forget. “Memories of Elvis” is about the details. It’s about creating an experience as opposed to a performance by infusing exhaustive research into a live event that will take your breath away. It’s an electrifying two-hour concert experience featuring powerful rhythm sections complimented with harmony, vocalists, and horns. “Memories of Elvis” journeys through Elvis’ music from the early Sun Recordings through the latter Las Vegas Showroom appearances – making it unmatched as the largest of any Elvis impressionist. 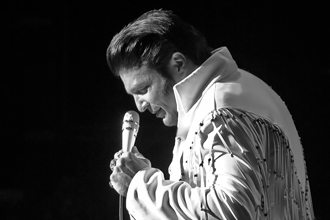 My name is Steve Davis and I am the artist behind “Memories of Elvis.” I’ve dedicated over 20 years to perfecting the Elvis experience by paying incredible attention to detail and now I’m proud to bring that experience to you. I don’t play to the vast percentage of people. I like to play to that one percent – that small group of people who might have seen Elvis in concert many times. Even the most discriminating fans of Elvis appreciate my attention to detail and authenticity. The most gratifying accolades of my performance come from those people who truly know and appreciate the Elvis experience. I’m a St Louis resident and Theatre Education graduate of Northeast Missouri State University.